A Nonalcoholic Eggnog That Will Knock Your Socks Off! Have you ever wondered how to make eggnog (especially a nonalcoholic eggnog) that will knock the socks off your guests? This traditional eggnog recipe can send folks staggering back clamoring for more. Break eggs into a medium to large saucepan. (I recommend eggs and milk from grassfed sources because of substantial health benefits. If you can’t find grassfed eggs and milk, use regular eggs and milk.) Beat eggs until creamy. Add milk and sugar and then stir. At serving time, whip cream and 2 tablespoons sugar until gentle peaks form. Pour chilled eggnog mixture into serving bowl. Fold whipped cream into mixture. Note: Although this is a non-alcoholic eggnog recipe in current form, rum may be substituted for the imitation rum extract if desired. Everyone Likes to Talk About Eggnog! What's Your Favorite? 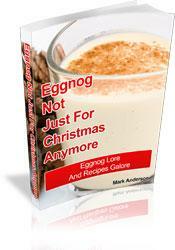 "Eggnog--Not Just For Christmas Anymore!" is no boring read. A bit of humor will tickle your funny bone. "Eggnog—Not Just For Christmas Anymore!" will eggs-ceed your egg-spectations! The holiday recipes are eggs-quisite; yes, even egg-stravagent. The multiple eggnog-for-breakfast strategies are egg-straordinary. Ever tried breakfast with eggnog? It’s quick, easy and egg-stra healthful.I originated nearly all these egg-sotic recipes myself. Maybe you think I’m egg-o-tistical, but enjoy the book, try the drinks. You'll most likely lick your chops and eggs-claim, ”Wow! Eggs-ceptional! Out of this world!”. Buy Ebook Now for Only $9.95!